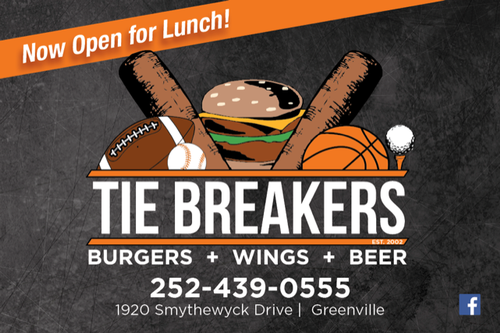 Tie Breakers Sports Bar & Grill is Greenville's premier locally owned and operated sports, dining, and entertainment venue. Tie Breakers serves the BEST Burgers, Wings, and Cheese-steaks in Greenville, hands down. Come try for yourself and become a Tie Breakers MVP. Off Charles Blvd on Smythewyck Dr.